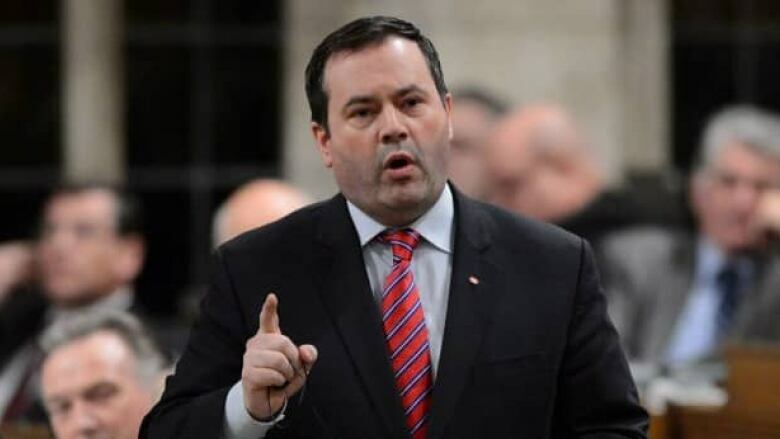 Refugee groups are accusing the Conservatives of backtracking on a pledge to increase the number of refugees resettled to Canada but Immigration Minister Jason Kenney says the government hasn't given up on its commitment. Refugee groups are accusing the Conservatives of backtracking on a pledge to increase the number of refugees resettled to Canada. Statistics show the number of refugees resettled in Canada in 2012 was down 26 per cent from 2011, despite repeated claims by the government that it`s aiming to increase refugee levels by 20 per cent. The figures also show the government didn't meet its own target for the number of refugees it planned to resettle. What was supposed to be an intake of between 7,500 and 8,000 ended up only being 5,412. "Canadians are proud to protect refugees through resettlement to Canada — but unfortunately the government has been closing the door on refugees," said Loly Rico, president of the Canadian Council on Refugees. Immigration Minister Jason Kenney said the government wasn't giving up on its commitment. "There is a civil war in Syria which has forced the closing of our Damascus office and that has affected the processing of settled files and we are working on that right now." "Having said that, we continue to resettle one out of every ten resettled refugees worldwide and lead the world in per capita terms," Kenney told the Commons. The office was the clearing house for thousands of applications from the Middle East, including those from thousands of Iraqi and Iranian refugees living in Syria who the government has agreed to resettle through its agreements with the United Nations. The immigration department said refugees out of Syria represented almost 35 per cent of Canada's total resettlement program from 2009 through 2012, until the closure of the mission in Damascus. There have also been calls for Canada to take in refugees from Syria itself. The UN estimated on Wednesday that the number of people fleeing the conflict there is now over one million. Kenney gave no indication a program targeting Syrian refugees was on the table. Canada, he said, is already playing a leadership role in the resettlement of refugees. "We take lessons from no one," Kenney said. The Canadian Council for Refugees disputed the idea the Syrian office alone was responsible for such a marked drop in numbers. "The government had most of the year to shift its focus elsewhere," the group noted in a statement. "The UNHCR has identified many refugees around the world in need of resettlement, many of them on an urgent basis." A spokesman for the department acknowledged the targets weren't met and said the challenges were not limited to Syria. "There have been security issues in many refugee camps in Africa, particularly those in Nairobi, Kenya which have prevented staff from accessing the refugee camps and selecting refugees for resettlement," Remi Lariviere said in an e-mail. He said the government is working with the UN to do its best to meet the target this year of resettling over 13,000 refugees, including thousands currently in Turkey and 1,000 Bhutanese refugees from Nepal. Security issues are not the only hold up in Nairobi. Beginning in 2011, the government capped the number of applications it would accept at that mission from private groups wishing to sponsor refugees from Africa. The cap was put in place to address the backlog of applications and processing times continue to be slow. Last year, government had hoped to settled between 4,000 and 6,000 refugees via private groups, and 4,212 were admitted. That's despite the Conservatives asking private groups to take on more refugees in a bid to save taxpayers money. The promise to increase refugee resettlement by 20 per cent was made in conjunction with an overhaul of the asylum system by the government in 2011. The government has said the changes are designed to help process verifiable refugee claims faster and avoid fake ones. But both the opposition and advocacy groups have argued the laws are flawed and end up penalizing the same people the government wants to protect. Meanwhile, the department appears to have uncovered a flaw of its own. Part of the overhaul to the refugee determination process has been the creation of a new appeal division for failed claimants. But the wording of the law as written could be interpreted to allow some people to have access to that process before the entire law takes effect. That was not the government's intention, the department said on its website. The New Democrats said it was a result of a bill getting passed too quickly. "When the minister rammed this bill through, the minister said, 'I believe this is an example of a process that works very well,"' said New Democrat MP Linda Duncan. "So why not now show real leadership and take responsibility for these mistakes?" Kenney said the bill received thorough debate and noted that no one on the opposition benches caught the mistake either. He said the government is now in the process of fixing it.